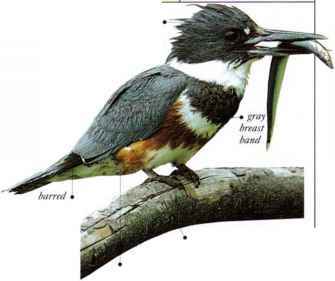 I'he sideways-curving bill of this bird is used for reaching under pebbles when feeding in stony riverbeds. The Wrybill eats aquatic insects and invertebrates, and possibly fish eggs as well. 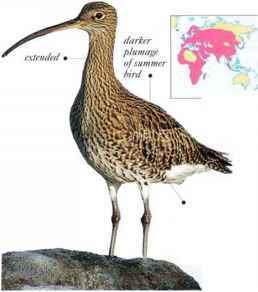 It nests on shingle banks by rivers, and winters in flocks on inlets by the coast. • Nest a shallow hollow formed by the birds, among pebbles. • remark The only bird in the world with a bill that curves sideways. 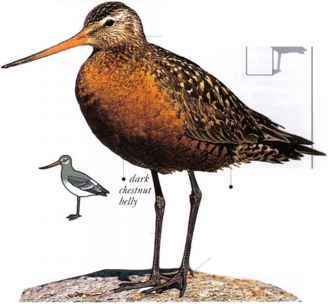 Long legs and a long, slightly upcurved hill equip this large shorebird to walk and feed in tall grass as well as mud. It also wades belly-deep in water, submerging its head and neck to feed. Prey includes insects, worms, and other invertebrates. This species nests on marshland near open water and on estuaries. In spring, the males perform a display llight, showing the undersides of their wings. These arc white, with the forward half black. In winter, the body plumage becomes duller, but the wings and tail keep their black-and-white pattern. • NEST A shallow depression, lined with moss or leaves. Breeds in Alaska and Arctic Canada. Winters in S.E. South distribution America.